Having an UNESCO heritage site dominating a city centre, also means visitors tend to forget to explore the streets behind it, as they’re herded between their tour buses and the main shopping street. But in Roskilde, a city with a thousand years worth of history, there’s plenty to see on those streets, and the city now has a plan for branding this area in order to attract visitors to the cultural backstreets. The development of a new lamp plays a vital part in it. We meet up with Birgitte Løkke, landscape architect, and Marie Berthelsen, cultural coordinator at the City of Roskilde – an official partner of Lighting Metropolis – for a guided tour of the neglected side streets in question. Within a few steps we’re suddenly surrounded by cobblestone streets, lush garden parks, museums and galleries – and it is clearly the type of area that tourists and visitors would love to get lost in after time spent on a crowded shopping street. If only they knew about it. Because at Roskilde’s planning and cultural offices, Birgitte and Marie have set in motion a new project that will make it easier to understand what the area has to offer to visitors, as well as navigating within it. “Our aim is to make visitors feel they’re in an enclosed cultural area, connected to the surrounding sites, but with its own distinctive look and feel. The development of a new luminaire just for these side streets will help to make the visual link between them”, says Birgitte Løkke. The so called Roskilde luminaire will not only be designed specifically for the cultural area, but also developed with Smart City technology as part of the concept, for solutions that can work as hard as possible to enrich the experience of the visitors. “It will be like opening up the City, connecting the old with the new, and ultimately offering visitors a fuller and richer experience of Roskilde”, says Marie Berthelsen. It’s easy to see what Birgitte and Marie mean, because a few side streets later into their guided tour and suddenly the Cathedral feels much further away, and more like a visual signpost for taking your bearing in the City, rather than a the one and only landmark to visit. Among the cultural sights within the area are the Museum of contemporary art, Museum of Roskilde, St. Catherine’s Priory, Roskilde Royal Mansion, ‘Byens hus’ with the old City Hall, the City library and the Bishop’s garden. 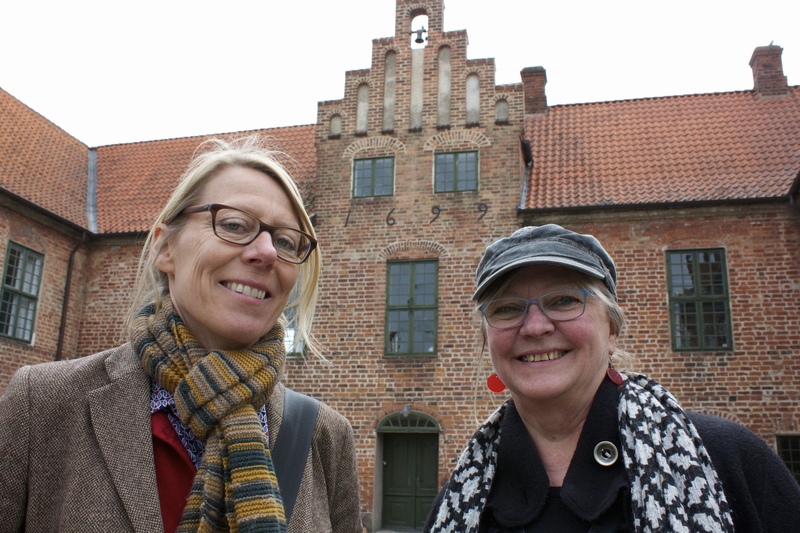 Birgitte Løkke, landscape architect, and Marie Berthelsen, cultural coordinator at the City of Roskilde, in front of St. Catherine’s Priory.